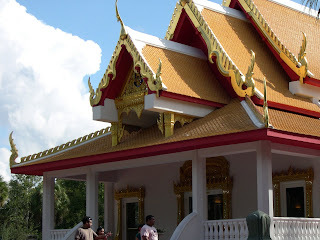 This is a photo of the Buddhist Temple we visited yesterday, the Wat Mongkolratanaram of Florida. People from all over the Bay Area come here to enjoy the temple, the meditation garden, the gorgeous view of the river, and the food. 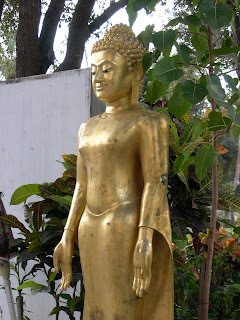 This statue greeted us as we approached the produce market on the temple grounds. We bought lots of wonderful, fragrant ingredients (which I’m already putting to good use). Here’s what I ate for lunch. I know the photo’s not pretty, but I was pretty deeply engrossed in my lunch by the time it occurred to me that I should take a photo. It’s a VERY spicy chicken with basil over jasmine rice. 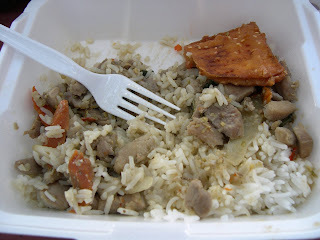 In the corner there is a fried sweet potato, which had been dipped in a (gfcf) batter that included sesame seeds. Had I known about that method of cooking sweet potatoes, I would have served THAT at Thanksgiving. Here are some of the folks responsible for the wonderful food we sampled at the temple. 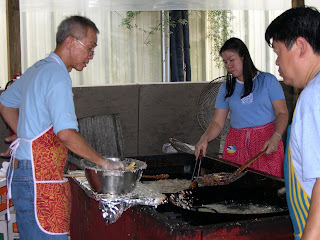 Some of the best Thai food I’ve ever had was made by these kind people. This entry was posted in Dining Out, Random Musings, Raves on November 26, 2007 by flamencomom. Looks and sounds delicious. You’ll have to email me the details of any decent Thai restaurant in this area – you’re making me crave Thai food right now! Annie, I’ll have to talk to Flamenco Dad about Thai restaurants near where you live; he works at the college, and I think he’s mentioned a Thai place in your neck of the woods. If not, I know of about 4 really good Thai places near me–not counting the temple. Maybe we’ll get together for a Thai lunch! A Thai lunch sounds lovely!